A collision for SHA-1 will be published before the end of 2015. SHA-1 is a cryptographic hash function defined by FIPS PUB 180-1, transforming an input message into a 160-bit output. It is designed to make it hard to find collisions, that is different messages that produce the same output. SHA-1 remains one of the most used cryptographic hash function without publicly exhibited collisions. MD5 and SHA-0 collisions have been published by August 2004. 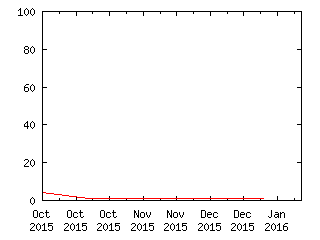 A theoretical-only attack on SHA-1 has been published by February 2005. Only published and experimentally verifiable messages count: messages submitted on condition of non-disclosure (e.g. to referees of a conference, including the judge), or too big for experimental verification by the judge nor any verifier the judge trusts, do no count. Date of submission of the messages to the judge may count only if the judge finds no other way to determine publication date. Date of verification is immaterial. The claim will be judged when the judge can determine its value. This will be either with value 1.00 shortly after publication of the numerical value of distinct messages which hash to the same value, or with value 0.00 at the due date.